The plans for fortifications built in the 16th century were often based on regular polygons, their layout being derived from a geometrical theory about the optimum arrangements for defence. 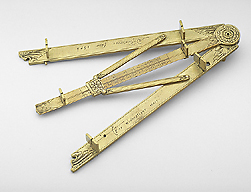 This instrument allowed the military engineer to set out the positions of the walls for such a polygonal fort with any number of sides between 3 and 20. Adrianus Descrolieres was more mobile that many contemporary instrument makers and worked in the Netherlands, Italy and France. The suggestion that this instrument may have been made in Antwerp derives from a signature on a quadrant made in the same year.